Dylan Bradford rolls out to his right against Raceland. 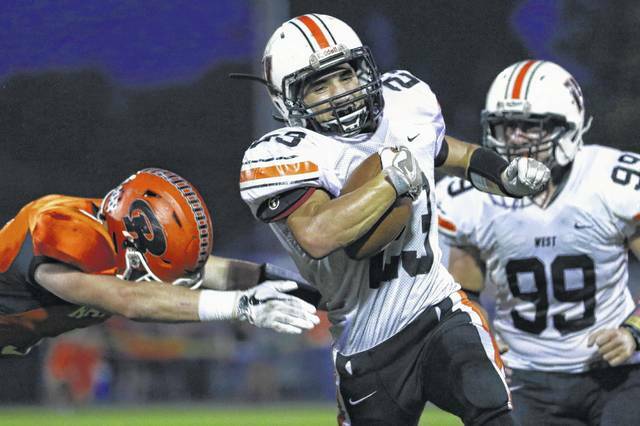 Josh Berry moves upfield against Raceland. Garrett Hurd runs through a Raceland tackle. Over the years, the West Senators’ football program has shown off a gritty, aggressive side that is comparable with some of the hardest working football programs around. Friday evening’s nonconference bout at Raceland, however, may have been the best example of that very point. Trailing by a 21-20 count late in the fourth quarter, the trio of Dylan Bradford, Josh Berry, and Garrett Hurd came up large as the Senators, behind an offensive line that never slowed, ended up scoring on a one-yard touchdown run by Bradford as West ended up scoring a huge 27-21 victory on the road over Raceland (Ky.), allowing the No. 7-ranked Senators to move to 5-0 on the year and maintain its No. 1 slot in Joe Eitel’s Division V, Region 19 rankings. In the opening quarter of play, West immediately asserted itself throughout the contest as the Senators’ defense, again, stepped up big with a huge takeaway, as Damon Black’s pass was read all the way by Cody Staggs. Staggs, however, wasn’t satisfied with just the interception, as the 6-0, 170-pound defensive back beat all comers to the edge for a 40-yard interception return that put West up by a 7-0 tally just 38 seconds into the contest. And while Raceland quickly answered with a long drive later on in the same frame that ultimately ended with a one-yard dive by Judd Adkins 42 seconds into the second quarter, the offense continued to maintain its efficiency and allowed Drew Cassidy to do his work. Two made field goals from Cassidy’s Division I-caliber leg (23 and 37, respectively) allowed West to take a 13-7 lead heading into the halftime break. 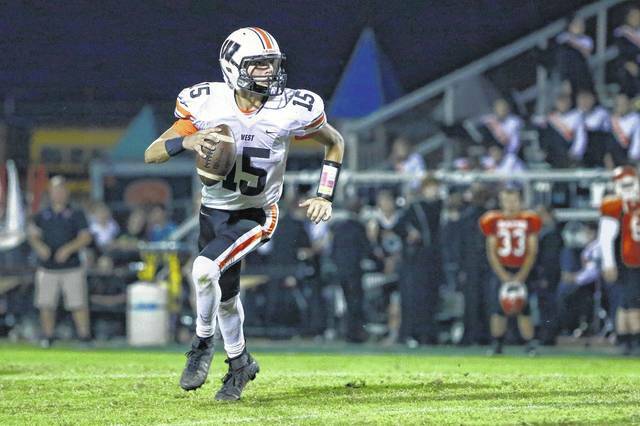 Both teams battled to a stalemate throughout much of the third quarter until Raceland’s Hunter Lacks broke through the line of scrimmage and collected a 61-yard touchdown spurt to put the Rams back on top, 14-13. However, like it never happened, West came back with a critical drive by Dylan Bradford as the Senators retook the lead, 20-13, with 1:29 to play in the third frame of action. As the fourth frame of action commenced, both teams continued to seesaw the lead back-and-forth as Raceland accumulated a critical 10-yard touchdown pass from Damon Black to Adkins on fourth down to give the Rams the lead back, 21-20. Bradford, however, wasn’t to be denied. On the fourth play from scrimmage during the ensuing drive, the senior rolled out and found Berry for a critical 54-yard reception. Then, with less than 45 seconds remaining and West at the one-yard line, Bradford capped off the scoring in the thrilling affair by taking a quarterback sneak in for the touchdown as the Senators moved ahead, 27-21, with 40 seconds remaining. West then forced Raceland to turn the football over on downs at the Rams’ 40 as the Senators collected a huge 27-21 victory on the road. For the contest, West was led by another fantastic effort from its skill position players, as Garrett Hurd carried the mail 23 times for 112 yards while Josh Berry additional 107 yards of total offense (54 receiving, 29 rushing, 24 passing) in an incredible effort. Bradford capped off the strong offensive effort by collecting an impressive 156 yards of total offense (83 passing, 48 rushing, 24 receiving) and two touchdowns on the evening. Defensively, West put together another gargantuan effort as the Senators held Damon Black and Judd Adkins to just 95 yards of total offense combined in the victory. Black was held to a 7-of-15, 65-yard output through the air while Adkins ran for just 39 yards on 11 carries. 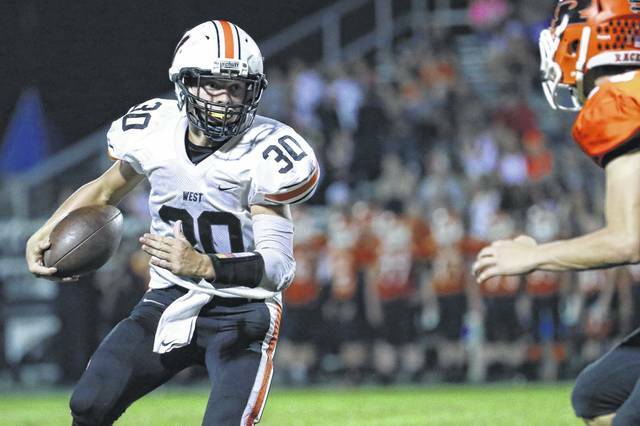 Defensive lineman Jakeb Guilkey created much of the problems that Raceland had to deal with throughout the course of the evening by collecting a baker’s dozen worth of tackles on the night, while Brandon Weaver added nine tackles on his own on the evening. Berry, along with Cole Staggs, Cody Staggs, and Sid Shifflet, each obtained eight stops on the day, and Gabe Skaggs, along with Ryan Spriggs, made seven wrapups apiece for the Senators. Shifflet and Spriggs each recovered critical fumbles in a complete effort from the defensive unit. Offensively, Bradford now has collected 466 yards passing thanks to a 39-for-59 mark through the air, while Hurd, who has eclipsed the 500-yard rushing mark for the season behind his 101-carry, 551-yard season, has collected five rushing touchdowns and a 5.5 yard-per-carry average. Berry’s 474 yards of total offense, along with four made field goals in five attempts from Cassidy, have been huge factors for West in its 5-0 start. Defensively, West has been led by Guilkey and Berry, who have collected 48 and 46 stops apiece. Guilkey has added six tackles for a loss during the season, while Berry has picked off three passes. Weaver (43 tackles, eight for loss), Skaggs (40 tackles), and Cody Staggs (team-high four interceptions) have also been critical for the Senators. With the win, West (5-0) will return to The Rock after winning three consecutive road affairs against Coal Grove, Wellston, and Raceland. There, the Senators will host Minford in what will be the SOC II opener for both teams. Kickoff is at 7 p.m.